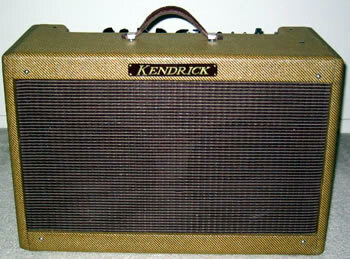 The Kendrick Specialty Blues Amp features kicked up 50's circuitry, two 10" speakers, all tube construction, epoxy glass/brass eyelet component board, massive interleaved paper bobbin output transformer, goes from clean to overdrive by variations in the volume control of the guitar and the pick attack. Most musical and richest sounding blues amp in the world. Made from 130 year old pine.